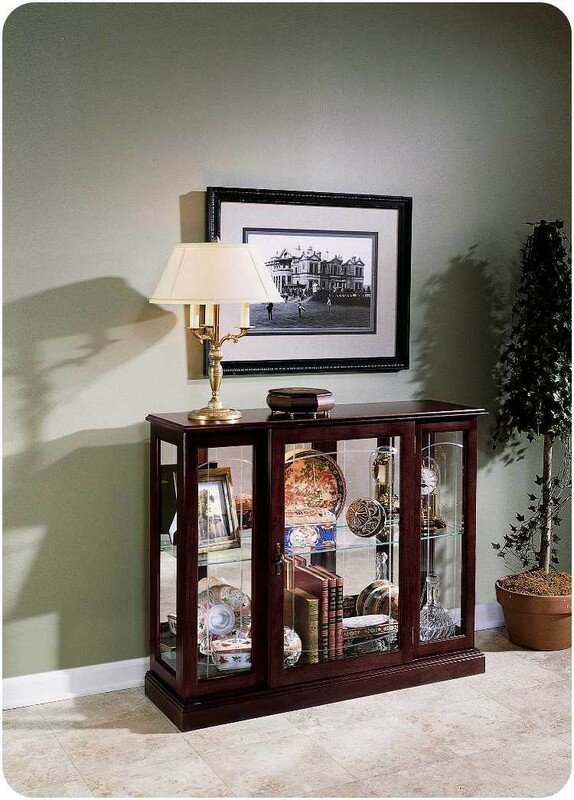 Capture the beauty inside and out with this Pulaski 6705 Console Curio cabinet from Carolina Furniture. It features a Golden Oak III finish on select oak hardwoods and veneers, V-grooved front glass, a lighted interior, a mirrored back, and an adjustable glass shelf. Whether it be a corner curio, mantel curio, round end curio, or two way sliding door curio, these curios are finely crafted occasional pieces. Some feature glass enclosed cabinets while others are open. Explore these curio cabinets and notice the impeccable detailing and wood molding across these pieces. Curios can be added to any room as an accent piece or a way to display collectibles, fine china, or valuable items in an enclosed, safe area. Most curios feature adjustable glass shelves, adjustable levelers, a lighted interior, a mirrored back and an optional shelf kit. Welcome one of these traditionally styled curios in your home today.